What is an Arizona Living Will? Arizona Living Will: What Is It? An Arizona living will is an estate planning document that explains your treatment wishes to medical professionals if you are unable to make those decisions at a later date. It allows you to name someone, known as a healthcare proxy, to make your medical decisions. The person you name to make medical decisions on your behalf should be at least 18 years old. An Arizona living will either needs to be signed in front of two witnesses or it needs to be notarized. Under state law, your witnesses cannot be related to you by blood, marriage, or adoption; be providing you with healthcare; or a beneficiary named in your will or be entitled to receive any part of your estate through inheritance laws in Arizona. Arizona Revised Statutes § 36-3201 to § 36-3210: Arizona’s living wills law does not approve or authorize suicide, assisted suicide, or mercy killing. 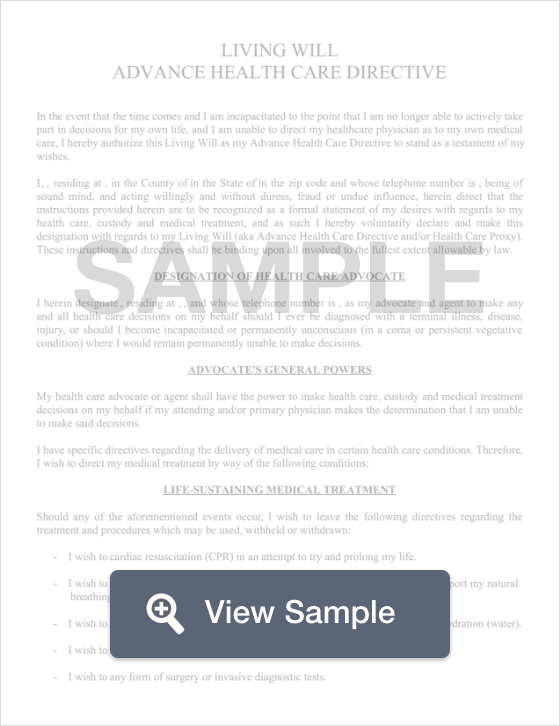 Additionally, a living will references a written statement created by someone who has not created a healthcare power of attorney and is meant to control the treatment decisions when the patient is no longer able to make their own decisions. An Arizona living will is used only for healthcare decisions. For personal belongings and to name the guardian of minor children, use an Arizona last will and testament.